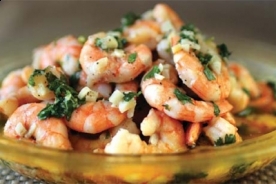 Rinse shrimp and arrange in a single layer in a 10x15-inch baking dish. In a small saucepan, sauté garlic in butter until tender. Remove from heat and stir in lime juice, salt, and pepper. Pour sauce evenly over shrimp. Broil for 8 to 10 minutes or until the shrimp are pink and tender.